A Little Passion: Has it been a year already? Sheesh! As I look out the window at the pouring rain, I think about what a good indication it is of my mood exactly one year ago today. 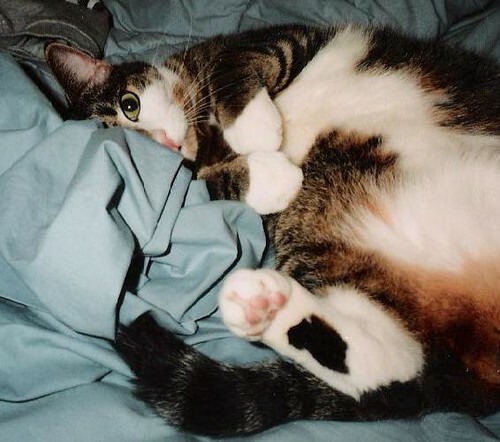 On April 4, 2006, I said goodbye to my feline son Elvis... kissed his face and held him. Although he no longer shares life with me in a physical form, I think he sends his love through his brother Peter, who now sleeps with me every night. Elvis was the one who hung out with me all the time, no matter which room I was in or what I was doing. I see him in other cats, like my brother's, who - even though she's a girl - looks a bit like him and makes some of his movements from time to time. It's enough to have me staring at her with my mouth open. I miss my boy every day. And I hope that no matter where he is right now, he's happy. Until we meet again, my baby.